Now available in Size L and Size 15/A! Size L: 115 yards per bobbin (white contains 125 yards). Size 15/A: 135 yards per bobbin (white contains 145 yards). Size "L" fits most home sewing, embroidery and quilting machines; check your owner's manual to find the correct size for your machine before ordering. How do I tell Size "L" from Size "15/A"? They're the same diameter, but Size "L" bobbins are about 3/8" thick while Size "15/A" bobbins are just under 1/2" thick. Click on the description to add one item to your shopping cart. Clear-Glide Bobbins - Size "L"
Clear-Glide Bobbins - Size "15/A"
Available in white and black only. Save when you buy in bulk! Clear-Quilt Bobbins by Fil-Tec are a 100% mercerized cotton prewound bobbin, designed for quilting and piecing applications on home sewing and quilting machines that use a drop-in bobbin. 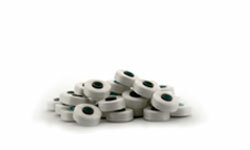 Washable and colorfast, these bobbins are available in several popular colors. Clear-Quilt Bobbins - Size "L"
Clear-Quilt Bobbins - Size "15/A"
All Threads is happy to introduce our own line of economically priced cardboard-sided prewound bobbins! But don't let the low price fool you -- these bobbins have been tested by dozens of customers who rave about how well they work and the outstanding quality of the bobbin thread. We're sure you'll love these bobbins -- give them a try today! These bobbins have cardboard sides and are filled with 134 yards of 100% High-Tenacity Polyester Filament bobbin thread. Size "L", fits most home embroidery machines. 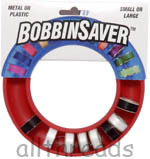 Store your prewound or metal bobbins with the Bobbin Saver! Magna-Glide Classic Prewound Bobbins are the top choice among commercial embroidery shops because they run almost "forever" without a glitch in tension. The patented magnetic core creates consistent tension throughout the entire length of the bobbin and eliminates the need to adjust tension as the bobbin gets smaller. Magna-Glide bobbins contain 135 yards (black contains 130 yards) of the finest-quality high tenacity 60-weight polyester filament bobbin thread. In Size "L", fits most home embroidery machines. NEB bobbins have rigid plastic sides, resulting in smoother running, fewer jams, less lint build-up than paper-sided bobbins and no wax build-up as you'd have with sideless bobbins. NEB bobbins are recommended by several manufacturers as the "preferred" prewound bobbin. Each NEB pre-wound bobbin contains approximately 131 yards of continuous filament polyester thread that is usable to the core for less waste. Wondering if NEB Bobbins will work with your embroidery machine? We've heard from customers who use NEB Bobbins in the following machines: Brother ULT-2001, ULT-2003, 3000, 8500D * Husqvarna Viking Designer I, II, Rose, SE * Janome Memory Craft 10000, 300E * Singer XL100, XL1000, Quantum Futura CE200 * Babylock ESE, Accent, Ellageo, Esante and Espree * Bernina 180, 185, 200E (you may need to disable the bobbin warning) * White 3300 * Pfaff - All models * Simplicity - All models * Elna CE20 and 6003Q. Not recommended for: Brother PR-600, Babylock EMP6. If your machine isn't on the list, it should still work with the NEB bobbins, provided it's designed to use the standard "L" size bobbin. If in doubt, consult the owner's manual or your machine dealer. Likewise, if you know of a machine not on the list that works well with NEB bobbins, please let us know! If you're looking for excellent Robison-Anton quality at a value price, these prewound bobbins are for you! Each bobbin contains 118 yards of the same 100% spun polyester bobbin thread we offer in bulk 10,000 yard cones. These bobbins are Size "L" and work in nearly all home embroidery machines. Currently available only in white. 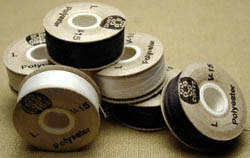 An economical pre-wound bobbin that works great in nearly all home embroidery machines. Each Coats bobbin contains 132 yards of commercial-quality high strength 100% polyester thread. Coats bobbins are Size "L" and will fit most home embroidery machines.